The community joined together on Oct. 28 to show their support in the fight against autoimmune diseases. 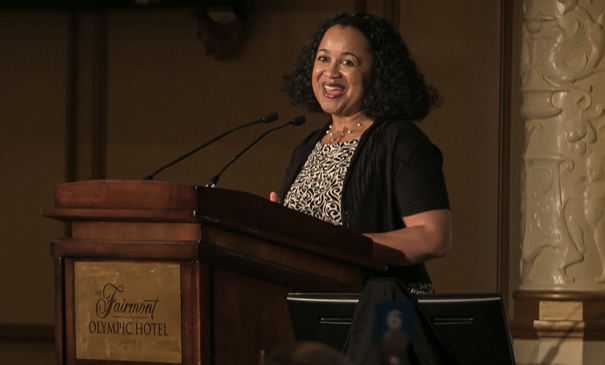 The Fairmont Olympic Hotel ballroom was filled to capacity to learn how Benaroya Research Institute at Virginia Mason (BRI) is Turning the Tide Against Autoimmune Diseases. Autoimmune diseases strike one in 15 Americans. There are more than 80 different types of autoimmune diseases, including type 1 diabetes, rheumatoid arthritis, Crohn’s disease, lupus and multiple sclerosis. There is no cure for these chronic lifelong diseases. BRI is one of the few research institutes in the world dedicated to discovering causes and cures to eliminate autoimmune and immune system diseases. During the event, BRI President Jane Buckner, MD, addressed key patient questions about autoimmune diseases by highlighting BRI’s medical research into these inquiries. “Research is the pathway to improving people’s lives and finding a way to eliminate these diseases,” says Dr. Buckner. Speaker Chiasha Dickens shared her challenges of being diagnosed with rheumatoid arthritis at a young age and living each day with this debilitating disease. Attendees learned financial support from the community is critical for BRI’s medical research. Every $1 given to BRI is leveraged into an additional $6 in research funding. These resources are vital for continuing innovative research, investing in new ideas and investigators and purchasing cutting-edge equipment. The luncheon raised a record $153,000 to make scientific breakthroughs possible, thanks to sponsors, donors and attendees.